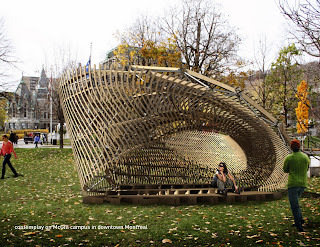 The ContemPLAY pavilion is a combined steel and wood structure created by the McGill School of Architecture DRS (Directed Research Studio M.Arch) students as research in advanced construction and contemporary architectural theory. It is built in collaboration with F.A.R.M.M. (Facility for Architectural Research and Media Mediation), and Maria Mingallon the Gerald Sheff visiting Professor. The project was launched to celebrate the new DRS program at the McGill School of Architecture. The pavilion was presented at the 99th Association of Collegiate Schools of Architecture annual meeting during March 3-6. It will be built in Montreal for McGill School of Architecture Cultural Mediations and Technology Conference during May 18-20 after which it will move to the SAT (Société des Arts Technologiques). The ContemPLAY pavilion is meant as a multi-generational artefact that gathers the ideas of contemplation and playing in a single clear gesture. 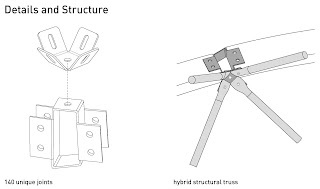 As a socially sustainable public infrastructure that plays with the visual field through form and cladding, it questions the current trend in public space furniture and encroaches in the realm of the abstract sculpture or artifact. 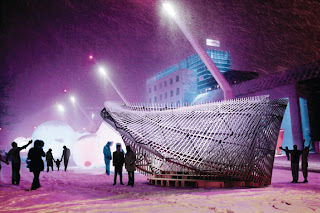 The gesture itself is a three dimensional mobius strip which is supported by a triangular truss. The truss is a combination of plywood and steel elements. The cladding is a visual pattern generated to create a simultaneous moiré and parallax effect. 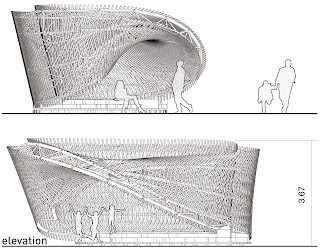 As the public approaches and engages with the pavilion, the visual field is modified and interrupted by the interference created by motion and the two layers of cladding. The eye continuously covers the never ending surface of the mobius inviting dynamic motion from the user. 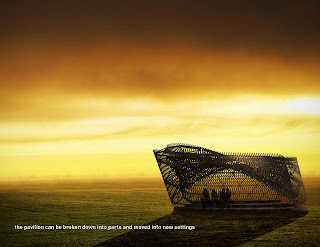 Within, a bench anchors the project to the ground, allowing for a center seat in a never ending structure. The light filters through the cladding generating an ambiguous relationship between the notions of inside and outside as well as furniture and shelter. As you move around the pavilion, new interference patterns are continuously created and destroyed though this mechanism of moiré; thus the pavilion creates a responsive, interactive experience. The simplicity of a half-twist in a ribbon was rendered extremely complex through the doubling and offsetting of the mobius strip: the creation of two surfaces activated the moiré but required strong yet minimal structural solution. 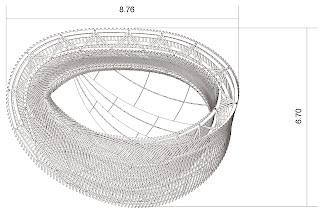 Our solution to this complexity was a space frame. 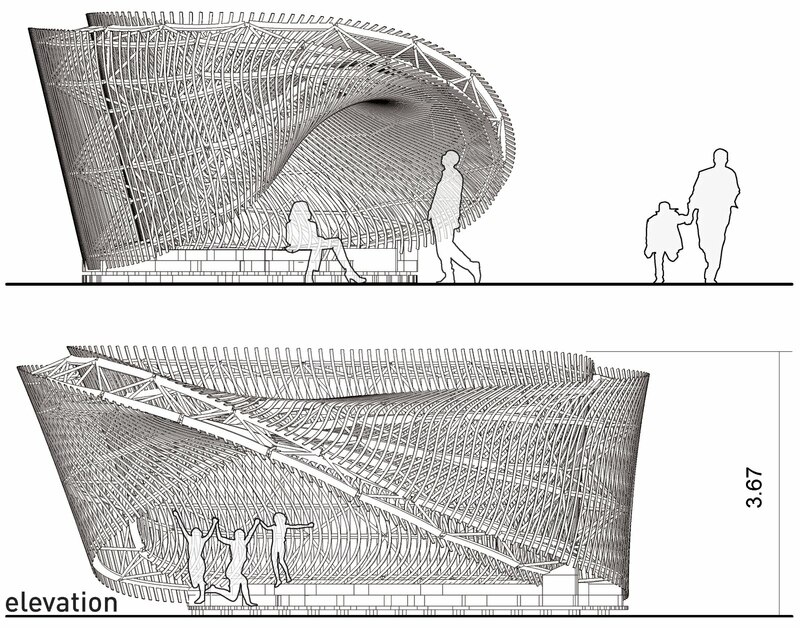 To resolve all these design criteria, the moiré pattern and an optimized space frame are generated via customized digital parametric modeling. That looks great, I'm sure that the designer is very proud of that creation. in such a perfect manner? I've a venture that I'm simply now running on, and I have been at the look out for such information.